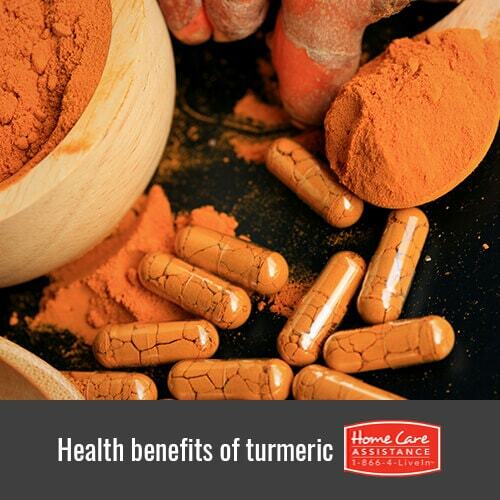 Turmeric is a distinctive yellow spice that has many health benefits. It’s best known for adding flavor to curry dishes but is also used in many different cuisines worldwide. It’s related to ginger, but the flavor is quite different. Turmeric has been used for many years in folk remedies and with the popularity of natural remedies becoming more mainstream, many are using turmeric to treat common ailments. The following details how turmeric can help seniors and how Orlando live-in caregivers can incorporate it into their loved one’s daily routines. Turmeric powder can be added to many favorite recipes including soups, salad dressings and tacos. It’s also a popular addition to homemade curry and will give it that vibrant color and flavor. Freshly sliced turmeric root or turmeric powder can be added to hot water with ginger and cinnamon for a warm and spicy tea that tastes great in cold weather. Adding turmeric powder to warm milk with honey makes for a creamy and delicious drink called golden milk that offers many health benefits. Turmeric supplements are also available for those who don’t care for the taste or who want larger doses than can be digested from consuming it in food. Turmeric has been shown to keep the brain young and healthy in those who live with Alzheimer’s disease or other brain degenerating diseases. A compound found in turmeric, called turmerone, can repair stem cells in the brain. Having a meal or drink containing turmeric each day can help keep the brain healthy. Another compound in turmeric, curcumin, has anti-inflammatory properties and may help with joint pain and arthritis. Starting the morning off with turmeric tea can help ease joint pain before it gets severe. Turmeric may also help to fight certain types of cancer by interfering with the growth and spread of the disease. When used this way, a supplement may be the best option as it provides the highest dosage. Whether you use turmeric to reduce your loved one’s arthritis symptoms or promote healthy skin cell growth, it is a beneficial addition to your kitchen. To learn more about other healthy foods, herbs, and spices to add to your loved one’s diet, reach out to Home Care Assistance of Orlando, FL. In addition to providing comprehensive home care for local seniors, we help our clients maintain healthy lifestyles by promoting nutritious diet, regular exercise, and socialization. Call (407) 604-0506 today to speak with a friendly Care Manager and schedule a complimentary in-home consultation.